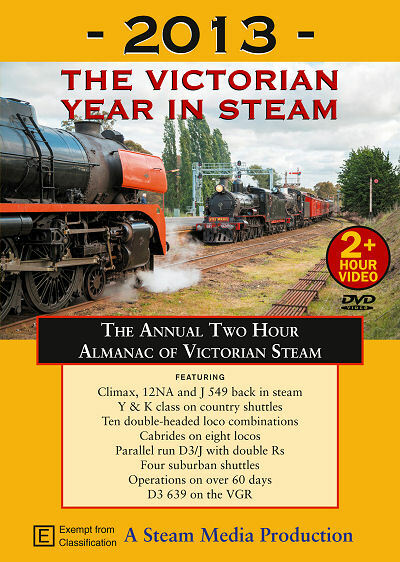 2013: The Victorian Year in Steam: This superb TWO HOUR and fifteen minute DVD comprehensively covers over 60 Victorian steam operations during 2013 featuring 20 different locos. Cabrides on G, K & J classes, Lukee, Climax, T 251 and Pozieres; and much more. 2013 was a year of loco restorations and double headers. The Climax geared loco and 12NA returned to service at Puffing Billy whilst J 549 again steamed on the Victorian Goldfields Railway. Ten double-headed combinations are featured including R 707 & R 761 running parallel with D3 639 and J 549. Y 112 joined K 153 on country shuttles at Ballarat. D3 639 visited the Maldon line for the first time in 40 years. Suburban rambles ran to seven destinations. Work on A2 986 continued apace. Cabrides on no less than seven locos add interest to this production. Copyright (c) 2016 Stylized. All rights reserved. Designed by NodeThirtyThree for Free CSS Templates.